Once upon a time, there was a Las Vegas hotel called the Imperial Palace. It was centrally located, but not big on things like “cleanliness” and “security.” Also, no one could really discern what the hotel theme was. And what’s a Vegas hotel without a theme? One day, The Imperial Palace disappeared and a place called The Quad was there in its stead. The Quad was an improvement on IP, but still had some issues. For example, no matter what time of day, the path to the casino would be blocked by clamorous co-eds and frat boys in line for a Brain Freeze at the frozen drink stand. We are talking at 10 in the morning! In line for frozen drinks!!! Suddenly, The Quad also disappeared and instead, there glittered The LINQ. Why is LINQ in all caps? Is it an acronym? An initialism? We have no idea. What we do know is that The LINQ, while still catering to a younger, louder crowd, is pretty nice. The rooms are newly remodeled (some of them have bunk beds! ), you can go to Hash House A Go Go for breakfast, and right outside is The LINQ plaza full of great restaurants and shops. The Yard House restaurant and the Sprinkles Cupcake ATM are our personal LINQ favorites. Also nearby is the High Roller ferris wheel, one of the must-do attractions on The Strip. And nobody ever missed Imperial Palace or The Quad ever again. The End. 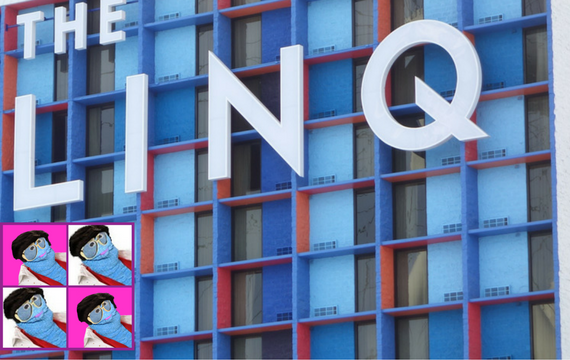 Coupon Puppet Loves Saving You Money With A LINQ Hotel Discount! Staying At The LINQ? Why Not Catch A Show Next Door At Harrah’s?